Supervisor Chad A. Lupinacci, Councilman Ed Smyth, Town Clerk Jo-Ann Raia and Tax Receiver Jillian Guthman were joined by Town officials, the Hispanic Task Force, Senator Carl L. Marcellino, Legislator Susan A. Berland, community leaders, local school districts, students and their families for the 24th Annual Hispanic Heritage Celebration at the Jack Abrams STEM Magnet School on Friday, September 28, 2018. Carmen Kasper, the Town’s recently appointed history-making first Latina Director of Human Services offered the first welcome of the night. Libardo Ramos served as Master of Ceremonies. Frank Altamirano, an All State Singer from Half Hollow Hills High School East, opened the celebration by performing the National Anthem. Josue Daniel Rivera, Lead Pastor at the Huntington Assembly of God, offered the invocation and benediction. The celebration included a keynote speech by counselor, educator and community activist Cristobal Benitez. 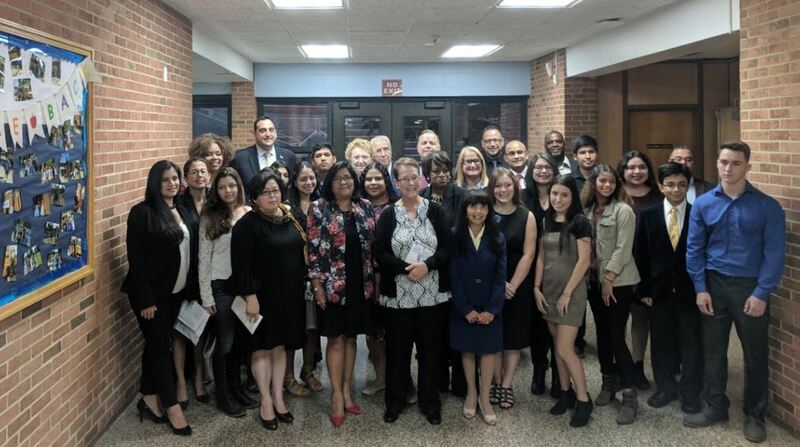 Cultural musical performances included dance performances by students from Walt Whitman High School and Huntington High School, a performance by Half Hollow Hills High School East’s Guitar Ensemble, and a dinner with a musical performance by the Triple M Fiesta Band. Julio Hernandez was honored with a Community Service Award and Student Achievement Awards were presented to Ivan Andrade, Victoria Bueso, Juan Carrasco, Francisco Chong, Rachel Friedlander, Sara Gallegos, Tatiana LaSalle, Anyi Mancia-Matute, Melanie Navarro, Brenda Perez Peláez, Henry Rivas, Samantha Rivera, Daniella Rodriguez-Rebolledo, Gabriella Rojas, Ricardo Romero, Katie Sierra, Michaela Soury, Aidan Tornquist, Jeannet Vargas, and Claudia Villatoro. The celebration was sponsored by Palacios Law Group, the Law Offices of David M. Sperling, People’s United Bank, and HealthFirst, with donations from Walgreens. 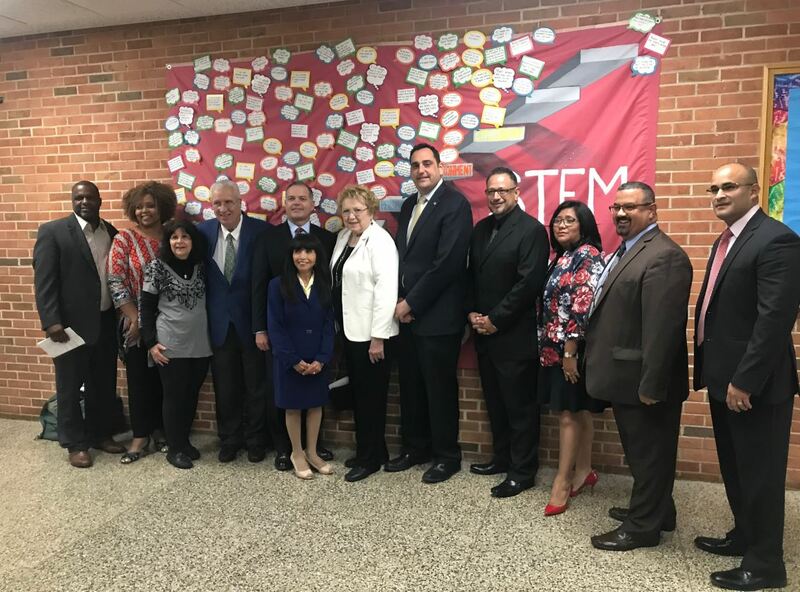 In the photos (l-r): (1) Director of Minority Affairs Kevin Thorbourne; Tax Receiver Jillian Guthman; Dr. Pat Marcellino; Senator Carl L. Marcellino; Councilman Edmund J.M. Smyth; Director of Human Services Carmen Kasper; Town Clerk Jo-Ann Raia; Supervisor Chad A. Lupinacci; James Callero; Pilar Moya; Cristobal Benitez; Libardo Ramos. (2) Group photo of Town, State, County officials, community leaders and student honorees.